It is curious to find two very similar recipes from the same period in two different regions of Spain, see aceite de almendras published on Oct 13, 10 for the Anón Al-Andalus version. Wash rice in hot water 2 or 3 times. Spread it on a large wooden platter and dry it in the sun or by the fire. Immediately, wash the pan and put it on the fire. Add 2 c almond milk that has been well strained with oil and salt. Bring to a boil. Immediately add the rice and simmer uncovered, stirring frequently to prevent rice from sticking to the bottom of the pan. Cook until mushy about 20-25 minutes. Whisk eggs, dissolved saffron and sugar in a small mixing bowl. 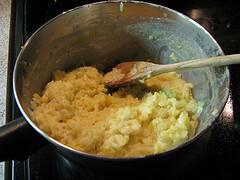 Put 1 tbsp of the hot rice to the egg mixture and beat vigorously. Add another tbsp of the rice and beat vigorously. Repeat until ½ c of the rice is mixed. Then pour this mixture into the saucepan with rest of the rice. Place it over low heat, for about 10 minutes until thickened, stirring frequently. Serve it in bowls. Sprinkle garnish on top.